Alyn Currie of Punkrockposters.net has this up for sale if anyone is interested. 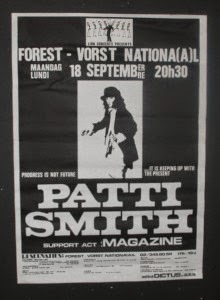 It's an original gig poster 84 x 61 cm for Patti Smith's Easter Album at the Forst Vorst National in Brussels, Belgium. Magazine were the support band at this show.